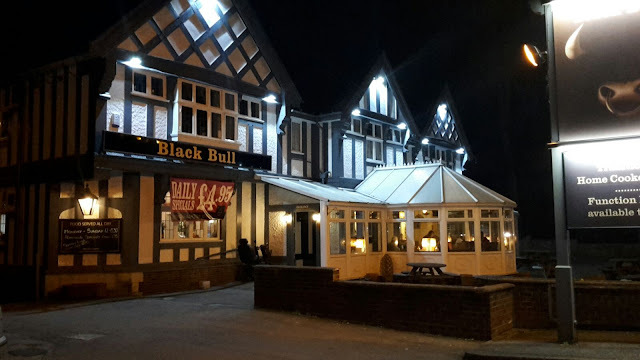 We've been driving past the Black Bull on the a60 heading North through Mansfield for quite some time and there's always a good number of people sat in their conservatory area eating. Usually that's a good sign so we've been saying we'd pop in and try. Friday night was finally our chance to sample the Black Bull Mansfield Woodhouse. It's quite rare I go for Mussels and there was far too much choice on the menu of what I would like. That's a positive, not a negative but it must also give plenty of others difficulty in deciding what to go for. After last weekend's meagre choice from 7 main meals at The Loom it was refreshing to see that many options up on the specials board alone. With Jem opting to go for the "bird that ate the piggy" option it felt good to go for something different. I was kicking myself a little when I saw an amazing looking portion of Chicken and Ribs arrive at the table opposite whilst we were waiting on ours cooking though. 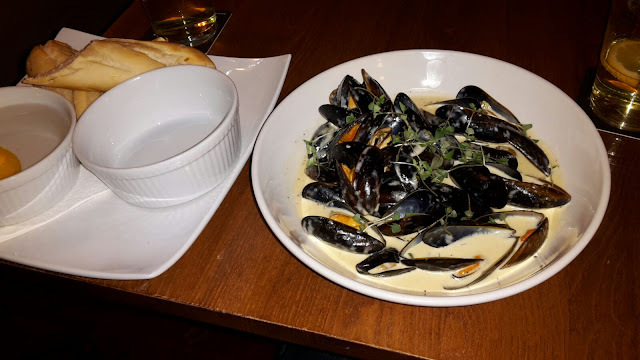 The Mussels came out in a large lipped plate alongside another plate with a bowl for my shells, lemon water and a generous sized warm bread baton for the sauce. As I made my way through the mussels I was finding that the white wine cream sauce was beautiful. So much so that I was using it to dip the extra portion of chips we'd ordered instead of the mayonnaise I'd requested. The sauce was so good I think I'd have easily polished off another baton without significant effort. Rather luckily (or by selection from the kitchen), not one of my shells was closed indicating the mussel wasn't to be eaten which was a nice bonus. At most places I've eaten in the past there's been at least on closed shell. I'd like to think that was due to the attention to detail of the kitchen. 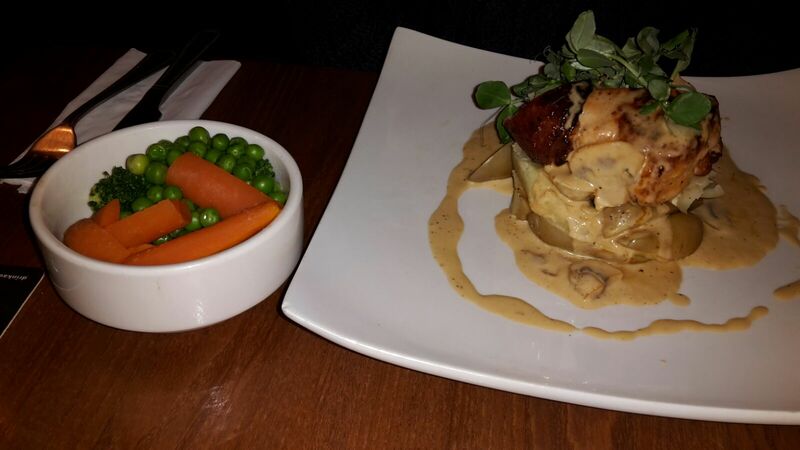 The Stuffed Chicken came out looking fantastic with the chicken on top of a layer of crushed new potatoes with a separate generous portion of piping hot seasonal veg alongside. The chicken came wrapped in bacon and was stuffed with pork, tomato basil, mozzarella and sausage making it very filling and hearty. 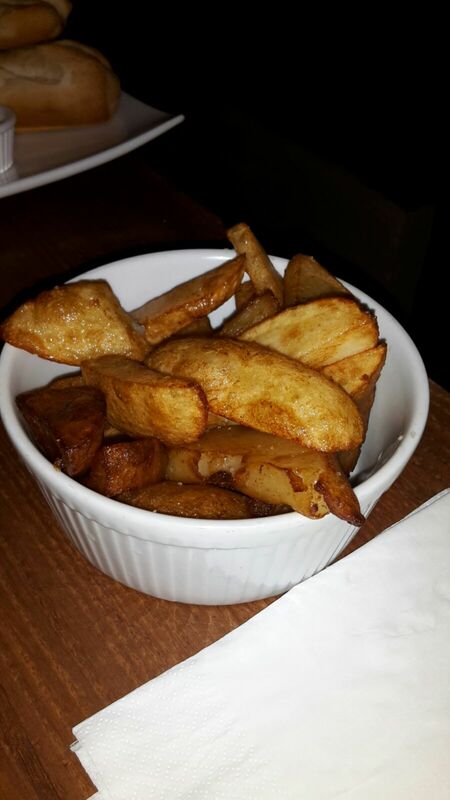 We ordered an extra portion of chips to go alongside the meal and these were a nice sized portion of home made chips. Very nice to dip in the sauce from the mussels and equally good with mayo. Well worth adding as an extra. We had a very nice meal at the Black Bull. Portion size was excellent and so was value for money. Two of us ate for just over £20 which represents exceptional value. The food was also very good with lots of choice for all so it's well worth a visit for good pub grub in the Mansfield area.